The first war between China and Japan in 1894/95 was one of the most fateful events, not only in modern Japanese and Chinese history, but in international history as well. The war and subsequent events catapulted Japan on its trajectory toward temporary hegemony in East Asia, whereas China entered a long period of domestic unrest and foreign intervention. Repercussions of these developments can be still felt, especially in the mutual perceptions of Chinese and Japanese people today. However, despite considerable scholarship on Sino-Japanese relations, the perplexing question remains how the Japanese attitude exactly changed after the triumphant victory in 1895 over its former role model and competitor. This book examines the transformation of Japan’s attitude toward China up to the time of the Russo-Japanese War (1904/5), when the psychological framework within which future Chinese-Japanese relations worked reached its erstwhile completion. It shows the transformation process through a close reading of sources, a large number of which is introduced to the scholarly discussion for the first time. 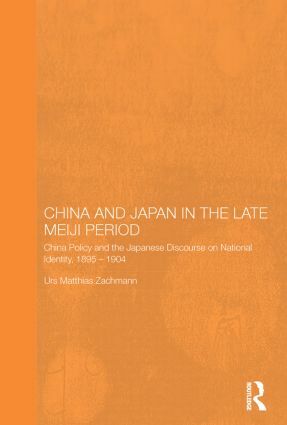 Zachmann demonstrates how modern Sino-Japanese attitudes were shaped by a multitude of factors, domestic and international, and, in turn, informed Japan’s course in international politics.